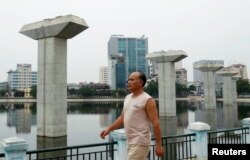 With every new skyscraper and supermarket, Vietnam inches closer to its official goal of becoming a modern nation. But it still lacks one type of transportation that many countries of the world take for granted: a subway system. After years of delays and debates, Vietnam now seems committed to a subway, with construction underway in both Hanoi and Ho Chi Minh City. Beyond obvious functionality and efficiency, there’s a sense that once these underground trains finally "arrive," so will Vietnam. “Because we are a developing country, we want to achieve what we think the developed world should have,” said Vu Thi Hang Hanh, deputy head of the architecture department at the Ho Chi Minh City University of Architecture. Hanh is a consultant for the city government, working on urban design around the subway stations. She cares about the practical benefits, but says other Vietnamese view mass transit as a high-tech sign of progress. The Southeast Asian country graduated to lower middle-income status in 2009, with current per capita income at $2,000 annually. The advent of subways could transform the look of Vietnam’s cities, with cracked sidewalks making way for newly-paved stairwells to underground trains. It also could transform city-dwellers’ habits and attitudes. For urban trains to work, commuters would have to give up the individuality of their vehicles, and embrace a communal service. Vietnam's commuters are famous for their reliance on the near ubiquitous motorbikes, but a Vietnamese-German University conference on urban planning last week had people brainstorming on whether those preferences could be changed. It’ll be hard to lure drivers away from their motorbikes because so many daily tasks can be done without leaving them, from weaving through a wet market for groceries, to picking up a phone card from a sidewalk vendor. Motorbikes make up 80 percent of vehicles in Ho Chi Minh City. They are usually cleaner and cheaper than cars, while also taking up less space, so drivers have less reason to switch to public transit. But subway supporters argued that if planners made stations inviting, in terms of access and parking, then people would combine both options. Estimates vary but in Ho Chi Minh City it’s believed that public transport accounts for less than 10 percent of traffic. That could change with the subway, which has a mix of funding from governments and other investors from Japan, Germany, Spain, and the Asian Development Bank. Japan's Hitachi Ltd. company is building an urban railway in Hanoi and plans to build another in Ho Chi Minh City. Pollution is a particular concern for Vietnam because industrialization has invited more greenhouse gas emissions than ever before, and because it’s one of the countries that could really be damaged by climate change. As for congestion, Nguyen Van Nam, lecturer at the Hanoi University of Transport and Communications, thinks Vietnam has three to five years to get more drivers off the road before gridlock becomes truly severe. He said the economy needs more efficient roads so that it doesn’t lose productivity -- through workers’ time wasted on commutes, and through companies’ time and money spent on logistics. The subway is just one part of an overall goal to make transportation cleaner. Other conference goers suggested Vietnam expand bus routes, raise motorbike emissions standards, encourage bicycles and electric motorbikes, and increase parking fees.